I began feeling a bit “off” right before Xmas…Fatigue (I mean, I couldn’t keep my eyes open…), immense fatigue…and a low-grade fever: those were my main symptoms. Nothing major, as you can see, but it was enough to slow me down at a time that is normally quite busy for me, including frenzied Xmas cookie baking and that sort of thing. The low-grade fever turned into a proper fever after Xmas, so I gave up fighting it and just slept. And slept and slept. Then, a day or so ago, the fever was gone. The main symptom is gone, but I’m still super fatigued. Bummer. That said, I’d much rather be fatigued than have THE DREADED COUGH! So, truth be told, this touch of flu hasn’t been all that bad. Many of our friends and neighbors have had a terrible time with this flu (one of my friends had it twice! ), so I can’t complain. Besides, I had the best nursing care ever. In addition to Stefano, of course, my adult cats made sure I was always warm and surrounded by purrs and love…Whenever I’d wake up from one of my comas, there they were…on top of me and/or around me. So comforting! P.S. After publishing this post, I thought I’d double-check the carfilzomib news (I usually do the reverse!) and found out hat these cardiovascular problems have been known for years now. Years! Quite a few studies on this topic have warned about the toxicity of this drug (from 2013, possibly earlier). So this study simply confirmed what was already out there. And this shows that I am not so up to date on conventional MM therapies…Then again, neither is Science Daily, hehe. Okay, I need to go check on the mad kittens now (they are SO active!!! ), and then go help Stefano with our New Year’s dinner, yum yum. I hope everyone has heaps of fun tonight AND heaps of good food and happiness! I just read a fascinating bit of news. After examining two Egyptian mummies (a man and a woman who had died, respectively, in 1800 and 2000 BC), an international team determined that they both had cancer…The woman had breast cancer…and the man had multiple myeloma. I had blood tests (and the Bence Jones 24-hour urine test) last week. My M-spike has gone down (it has actually been going down a wee bit for the past two tests, so this is the third “wee bit down”). Total IgG is also down (for the second time, when compared to my last few tests). My hemoglobin is in the normal range, even though my red blood cells are slightly low, but just slightly. Everything else looks pretty much the same. Almost everything, certainly anything of importance, is a wee bit better compared to my most recent tests. For example, my monoclonal component hasn’t been this low since 2012. And my freelite chains have also gone down quite a bit. You are probably curious to know what I’ve been taking. Not much, actually. I mean, in addition to using Nigella sativa in my food, I’ve been taking my usual 8 grams of C3 Complex curcumin a day, divided into two doses (4 grams at lunchtime, 4 at dinnertime). And, since last summer, I have been testing a Ganoderma lucidum supplement: 960 mg, twice a day (again, lunch and dinner, together with the curcumin). Well, the Ganoderma seems to have done something, for sure. 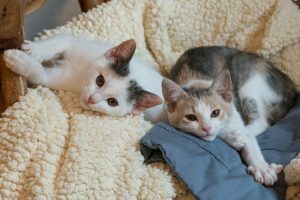 Or could it simply be the “kitten” effect (see photo of Pandora, left; Pixie, right)? Meow!!! Ciao, everyone, and may the holiday season bring GOOD NEWS to you, too!!! At any rate, I thought this study might be of huge interest to anyone who is taking carfilzomib right now…and so I wrote this quick post! But now I have to get back to my kittens (the vet is coming to visit them day after tomorrow…I so hope she will give us some GOOD NEWS…!!!). Ah, myeloma stem cells. Those darned thingies. Coincidentally, lately I’ve been working on a post about MM stem cells (it’s taking much MORE time than expected, mainly because of the kitten issues we’re having in this period, as you know by now…). Anyway, c’mon, let’s get those clinical trials going, especially since the drugs that inhibit ADAR1 are already on the market. It’s a no-brainer!! !